BTW – Cuoldn’t help researching it a bit (ya can’t keep a good librarian down). Here’s the USGS page about the Channeled Scrablands. http://www.nps.gov/history/history/online_books/geology/publications/inf/72-2/sec5.htm Fascinating! Thanks for the link deb, I had never really heard about the Scablands……..never to old to learn new things. Matt is not just our Chief Hobo but also a teacher. Love librarians!! Thanks for the link deb. Matt, or Jason, also has a link to this underneath this picture post. I missed it at first but it’s there, lower left corner under the pic. This is quite the change from Montana & Idaho, right? But, soon he will cross over back into wonderful trees and green. Out in those parts (where he is now) it’s more about the wheat, grapes and flatter, wider spaces. Thanks for mentioning it Jim in AR via MN! errr, is there anything living, in this location? it appears very ‘dead’. some hobo guy that likes to walk around. Usualy heading towards the sun set…but that is it…him and the tumbleweeds. WOW. Those are some wild rocks. I’ve never seen anything like it before. 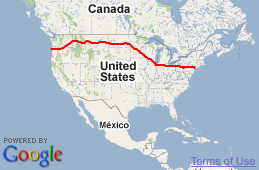 This is definitely a different part of America I’ve never seen or heard of before. Dorinda try this link….http://www.nps.gov/depo/… it is devils postpile in CA and is the same type of rock. I don’t ever remember hearing or learning anything about any of this at all. Matt are you sure you’re still on planet Earth? Doesn’t look like it to me. Look so weird. I agree with charlie, is there anything alive out there besides you? Something not widely known outside of the “Inland NW” is the fascinating geological history of this area. The Western half of Oregon & Washington and the Northern part of Idaho, & Northwest Montana, are mountainous, green and wet, The rest of those states is dry & full of rocky outcroppings & plateaus & high desert. 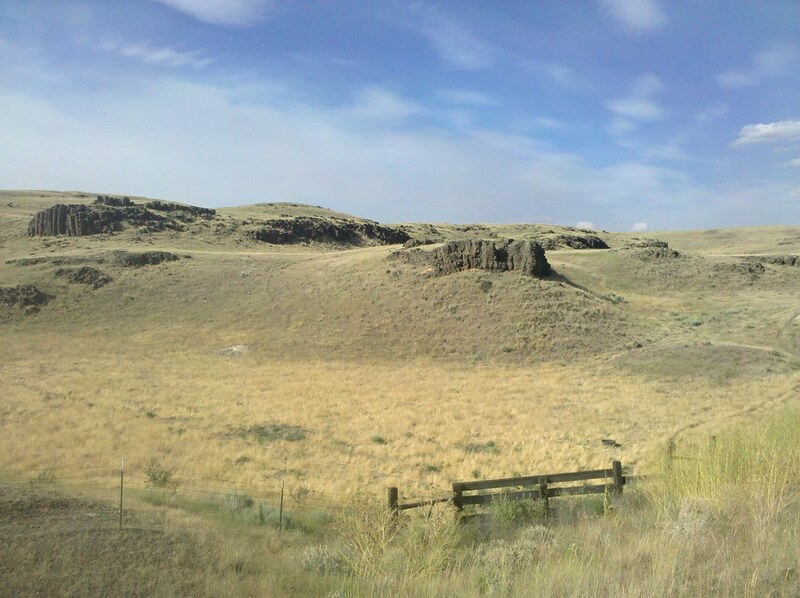 The “coulees” between Banks Lake & Soap Lake are spectatcular. Matt will see the beautiful green fir trees on the West side soon. Temperatures in Portland right now are 70’s but within a few days are forecasted to be mid-90’s, & more humid than East of the Cascades. Keep your hat on & drink lots of water, Matt! Day 143: Awesome! Want a beer?